Attract more birds to your garden when you grow these six plants. Birds love their berries and seeds! Your garden’s flowers fill your yard with beauty, color, shape and even fragrance. But that’s not where their interest ends. 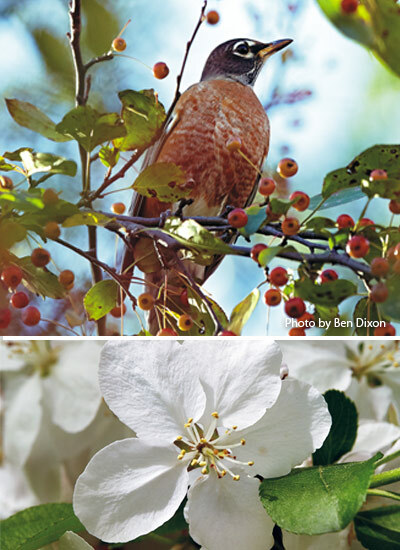 Throughout the year, seedheads, berries, nectar and fruit draw in winged visitors, such as songbirds and hummingbirds, providing them with the energy they need to perform essential functions, like flying, mating and migrating. Including a mix of trees and shrubs in your perennial border doesn’t just create more food options. It provides good cover, too, so birds can find shelter and feel protected while they eat. Check out these must-have favorites for birds, and then read our article 10 plants to attract hummingbirds to your garden to meet several hummingbird magnets! 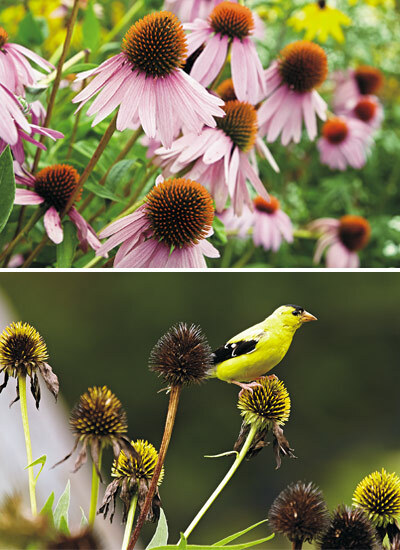 It’s easy to have impressive masses of stunning blooms with low-maintenance coneflower. But don’t cut back the daisylike summer flowers once they start to fade in early fall. The pointed seedheads are favorites for blue jays, Northern cardinals and finches, including the American goldfinch above. Plus, the dried cones add interesting shape to the landscape through winter and help the native wildflower spread — deadheading spent blooms prevents reseeding. In spring, just cut stems back to the base of the plant. The old-fashioned purple-pink, above, and white varieties of purple coneflower (E. purpurea) have dark green foliage that’s covered in small, rough hairs — a trait that deters deer and makes for strong drought tolerance. But all coneflowers will thrive in almost any type of soil, from dry to clay to rocky. Just be sure plants get full sun to part shade — in at least 6 hours of sun, blooms attract butterflies and hummingbirds throughout the summer, too. 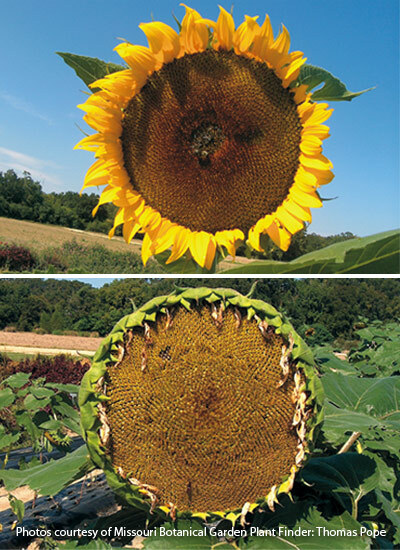 Want to bring in birds with annual sunflowers? Then the bigger the flower’s center, the better, so choose traditional dinner-plate type blooms, just like you see at above. That’s because larger seedheads mean more seeds from late summer on, as well as a better landing surface for winged visitors — whether you leave the drooping seedheads or cut and stick stalks elsewhere. These long-lasting flowers need full sun to bloom their bes — this keeps stems strong, too, so you don’t have to stake leaning stalks. 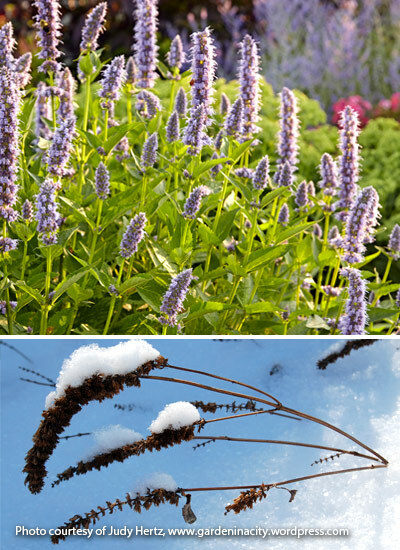 For the most color, blooms and birds, plant seeds staggered about 3 weeks apart, beginning right after the last frost and continuing through midsummer. Thin seedlings to 1 to 3 ft. apart, depending on the cultivar. Get multiple seasons of interest from one shrub. Cranberrybush viburnum’s white lacecap flowers, above, bloom in spring, and in fall leaves take on tinges of purple and yellow. Bright red berries form in late summer. Tart and juicy — similar to cranberries — these feed birds, such as cedar waxwing and Northern cardinal, from fall through winter. 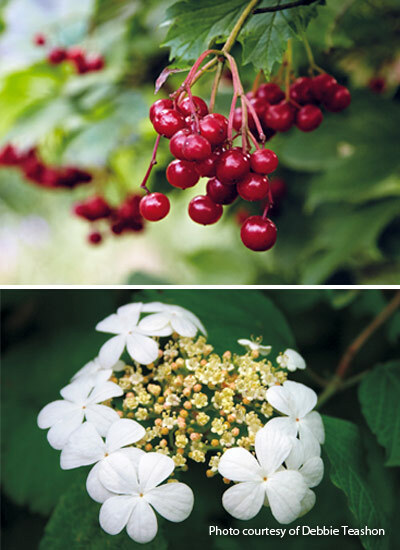 Dense summer foliage, along with a naturally rounded habit, makes cranberrybush viburnum a good hedge anywhere you need to add privacy or create a barrier. It handles a wide range of soils but does best in a moist, well-drained spot. To keep larger cultivars compact, prune select branches after flowering finishes. Be patient, though — newly planted shrubs may not develop berries for a few years or until they’re well-established. Anise hyssop’s long-blooming blue flower spikes bring in hummingbirds, as well as butterfl ies and bees, from summer to fall. To encourage more blooms throughout the season, snip stems at the next leaf joint as they fade. But leave spent stems standing in midfall, as flowers start to dry — finches love the clusters of tiny seeds. They hang on well into winter, providing energy when other food sources may be depleted. ‘Blue Fortune’ above has all the great qualities of the species, including drought tolerance and deer resistance. Flowers stay upright on sturdy stems, and the foliage also has a pleasant black licorice fragrance. However, at 24 to 36 in. tall and 18 to 24 in. wide, this cultivar is more compact and a good choice for the middle of the border. Wherever anise hyssop goes, though, it will create an interesting mound of color. Just be sure it has a spot with well-drained soil — this perennial takes dry soil in stride, but its crown can rot in too much moisture. Flowering dogwood’s showy white, red or pink petals are actually bracts. The flowers are the green-white buttonlike cluster at the center, and this is what matures to the bright red fruits you see in the photo in late summer to early fall. Though inedible to humans, they’re well-loved by birds, such as bluebirds, grosbeaks, tanagers, dark-eyed junco and titmice, and hang on well into winter. 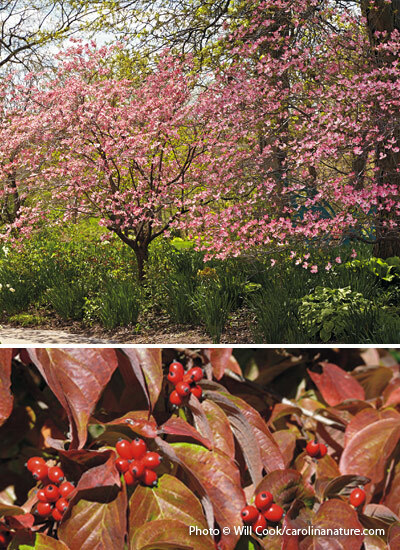 In fall, its dark green leaves turn brilliant shades of red — for the best autumn color, give flowering dogwood a place in full sun. Low-branching with a relatively horizontal habit, this tree will still grow and bloom well under the canopy of larger trees, like you see in the photo. In fact, in areas with hot summers, flowering dogwood will benefit from some shade, especially early in the afternoon. Flowering crabapple is practically synonymous with spring, and for good reason: Blooms almost cover the entire length of branches, filling the warming air with sweet fragrance. 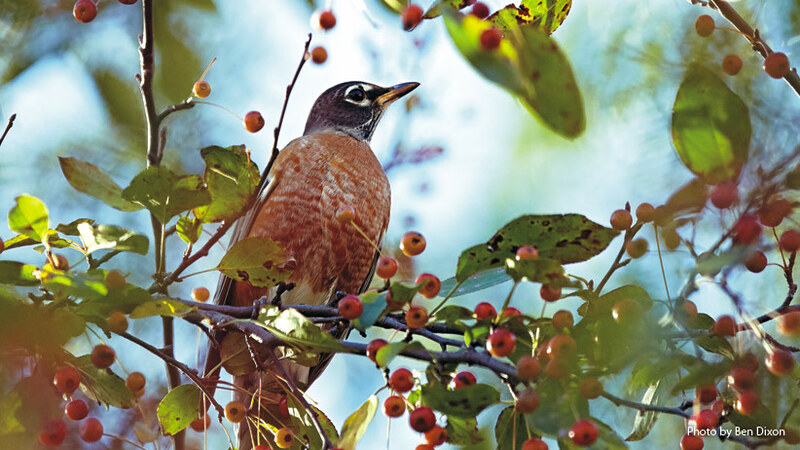 On top of looking striking in spring, its red or yellow fruit matures in late summer to early fall, depending on the cultivar, bringing in all kinds of birds, such as the American robin, above. Plus, crabapples hang on reliably into winter for birds, such as cedar waxwing, to enjoy as the fruit softens after each freeze. Thanks to a range of sizes and canopy shapes, you can plant this tree almost anywhere — even in small yards — but for the most flowers and fruit, give it a spot with full sun. Although flowering crabapple can adapt to most soil types, it prefers a slightly acid pH range between 6.2 and 6.8. And since many cultivars have foliage that changes hues as it matures, plant where you’ll have a good view of your tree to watch the color show, as well as the birds that visit. To keep trees tidy, always cut back sucker growth at the base of the tree. If you need to prune branches, do so in late winter or early spring.